Primate labs at Harvard Medical School will “largely shut” by 2015. The University cites economics and strategy change. Four primates reportedly died due to oversights between 2010 and 2012. ADI is at the forefront of efforts to shape the UK’s new law on animal experiments and ending secrecy on experiments. We led a delegation of celebrities and Members of Parliament to deliver a message to British Prime Minister David Cameron on World Day for Laboratory Animals. In 5 days at Los Angeles International Airport, authorities intercepted nearly a half-pound of elephant meat, a dead stuffed primate and almost 400 snake, lizard and crocodile skin handbags. 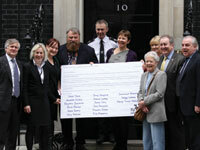 ADI is part of a coalition to halt Britain’s badger slaughter. The Government organized cull has now been stopped after failing to meet targets but may resume. "We will not allow dolphinariums" states India’s Environment and Forest Minister after call from ADI and 60 other organisations, as well as scientists. One of 25 dolphins en route from the Philippines to Resorts World Sentosa’s, Singapore, died during the 3 hour flight. A tiger survey by forest and nature protection officers from Nepal and India is identifying the number of Bengal tigers living across wildlife reserves.